GOLISI Needle 2 Compact Mini ChargerThe Needle 2 from GOLISI is a compact yet powerful min..
GOLISI L2 Compact Mini ChargerThe L2 from GOLISI is a compact yet powerful mini charger which utiliz..
GOLISI i4 ChargerGOLISI i4 is the upgraded version of our star charger S4, it not only inherits the ..
Hohm Base Battery ChargerT H E D E F I B R I L L A T O R O F D E..
ECTO Wall Charger AdapterWall charger adapter for ECTO brand batteries and kits. Charging cable is n..
Hohm School 2 Battery ChargerWHEN AN INTELLIGENT CHARGER ISN'T SMART ENOUGH... G O ..
Jmate Car ChargerP O W E R D R I V E C A R C H A R G E R .Input: 12V / 24VOu..
Jmate Portable Charging Case M A T E F O R Y O U R V A P E ..
Nitecore UM10 Battery ChargerCapable of charging Li-ion batteries and an external device, simultaneo..
OVNS J-Box ChargerS E L F - C O N T A I N E D P O W E R B A N K .The J-Box P..
Julmate Charging CaseDo you find yourself breaking, losing, or constantly searching for a place to c..
Efest LUC Blu6 Bluetooth 6 Bay Charger - New Updated VersionCONVENIENT CHARGING FOR ANYWHERE YOU WAN..
GOLISI S6 Smart ChargerGOLISI S6 is a highly intelligent charger designed in response to customers w..
EFEST Lush Q8 LED Intelligent Indicator ChargerThe Lush Q8 can charge different types of 3.7V cylind..
GOLISI O4 Smart ChargerGOLISI O4 is an economic and practical battery charger. It convert the high e..
GOLISI i2 Smart ChargerThe GOLISI i2 is a compact yet powerful mini charger which utilizes a USB pow..
GOLISI S4 Smart ChargerGOLISI S4 is Golisi’s star product. It has a highly visible HD LCD display, t..
GOLISI S2 Smart Charger GOLISI S2 is a smart charger with a highly visible HD LCD display, its ..
BLACKCELL BU4 CHARGERSpecifications: Input Voltage：DC：USB-5V 2A&nbs..
BLACKCELL BIC2 ChargerSpecifications: INPUT: AC100-240V/50-60Hz DC5V1.2..
XTAR VC4 Battery ChargerClearly see what’s going on with the batteries. • Tac..
XTAR VC2 Battery ChargerTell you the real capacity of your battery! • L..
XTAR MC2 Portable ChargerSimple but not normal. 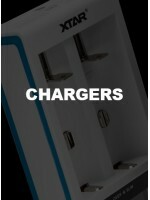 • Ultra-compact size &nb..
XTAR MC1 Portable ChargerThe simplest charger you will ever need. • Ultra-por..
Jili Box 1200mAh PCC Charger for JuulJ U U L P O W E R B A N KThe Jili Box i..
OVNS USB Charging Cable for the JuulOVNS USB Charger for Juul is a tiny charger that is portabl..
Nitecore V2 Smart Battery Car ChargerThe Nitecore V2 Smart Battery Car Charger can rapidly charge yo..
Kanger UBOAT USB Charging DockThe Kanger UBOAT USB Charging Dock; It is used for charging the UBOAT ..